This may sound weird, but it's just as important to understand the things you don't like doing as it is to understand the things that you love doing. If you think about classes you didn't enjoy in high school, think about why you didn't like them. Was it the content? The teacher? Thinking about what you don't like doing can actually rule out a lot of majors. I sat down in the lecture and the professor immediately started talking about how you shouldn't be a journalism major if you aren't willing to venture out at 3am to interview random people on the streets about your story. *crickets*... This was NOT me. He began discussing how you should be up all night writing and rewriting your story, probably crying, because it's due the next morning. I immediately got up and left the lecture. And that, ladies and gentlemen, is how I decided journalism was not for me. See? It can actually be super helpful to figure out what majors you want to steer clear of. My current major, communications, is extremely similar to journalism, but it's much broader and you can do a lot more with it other than being a journalist. If you think about it, you want to spend your career doing something you love. Sure, not everyone (even those who love their job) is excited for work every single day, but you can certainly major in something that's going to lead you to a career you'll truly enjoy. For example, writing has always been one of my hobbies. I've also always been fascinated by people and the interactions that they have with one another. I've always tried to work towards effective communication throughout my life, and therefore, I felt like communications was the right path for me. Not everyone can turn their hobbies into a career, but you can definitely incorporate them. Another example: if you enjoy skateboarding, maybe you could study graphic design in hopes of one day designing the images on certain skateboards. Try to think outside of the box and figure out how your favorite things can be molded in a career that you'll love! I completely agree with the statement "You can be anything you want in life", but I also feel that being practical and realistic is important when it comes to selecting the right major. If you're paying all this money to attend college, you might as well study something that you can succeed at. If blood makes your skin crawl, nursing probably isn't for you. If you hate math, engineering is likely not the major to choose. Be practical in the sense that you should do something you enjoy (again, going back to the first point, think about what you don't like). Be practical in the sense that you can actually see yourself spending your life working in that particular career! If you're like me and you never had interest in a very specific area (such as being a doctor, a nurse, an engineer, etc.) go with something a bit more broad. The field of communications is definitely a broad field, and you can really customize the major to make it your own by establishing a minor or a concentration. You can also show your interests through your internships and other professional experience! Now, obviously not everyone wants to be a communications major (haha), but hopefully you get the idea that many majors really do allow for a lot of customization. Some dream jobs may not correlate to a major as easily. If you're interested in working for a magazine (one of the things I would love to do in the future) there's a lot of different things you could study to get to that point. If anyone is in the process of trying to choose a major, feel free to shoot me an email (thedailydelicacy@gmail.com) and I would love to chat with you and hopefully offer some advice! 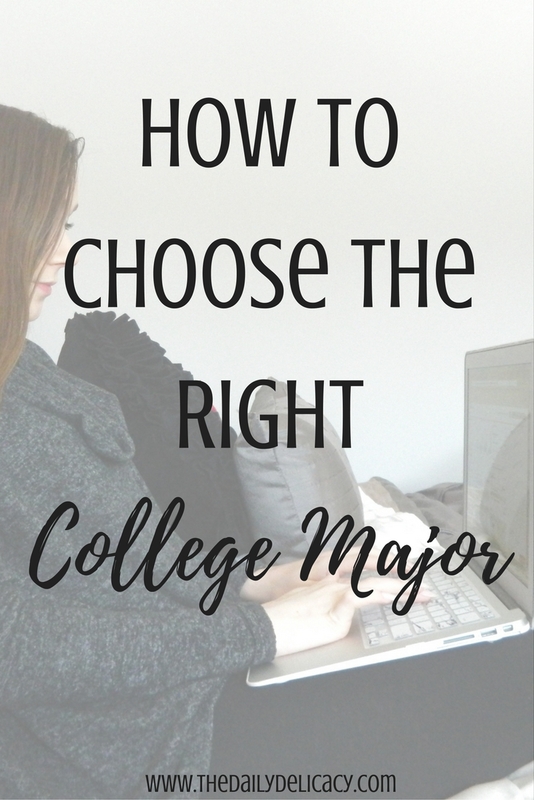 What are your tips for choosing the right major? This is such an amazing post babe! It definitely will help so many girls in choosing the right college major :) Have a great day love! What a great post! I wish I had stumbled across this when I was deciding my major - it definitely would have helped me narrow down my options.